Looking for delicious healthy lunch recipes for kids? These adorable sandwiches will have them running to eat their veggies! Getting my children to eat vegetables used to be a challenge. I’m not sure why many children view vegetables with suspicion but they do. They absolutely love to eat fruit but for some reason, getting them to enjoy vegetables is not as easy. I have tried hiding the vegetables in another food. I have tried allowing them to dip the vegetables in dips and dressings. Sometimes I have good luck with this but often it is still difficult. I have found that one of the easiest ways to get kids to eat their vegetables is to make them fun to eat. You can easily make your sandwiches with the bread in cute shapes using a cookie cutter or a sharp knife. Today I made a sandwich into a flower and used the carrots and celery sticks to create the petals and stem of the flower. I created the center of the sandwich using a round cookie cutter. Then I just added sandwich filling like I would a traditional sandwich. Filling for the sandwich. You can use filling like tuna fish or peanut butter and jelly easily. If you want to use sandwich meats and sliced cheese, you will need to cut them out using the same cookie cutter to fit the bread. Cut out as many pieces of bread for sandwiches as you feel your child will eat. You can make more than one flower sandwich for them. If you only want to make one sandwich, you will need to have two pieces of bread. Slice thin strips off each side of a celery stick to act as the grass or leaves. Leave one celery strip whole to act as the stem. Place the sandwich circle in the center of the plate. 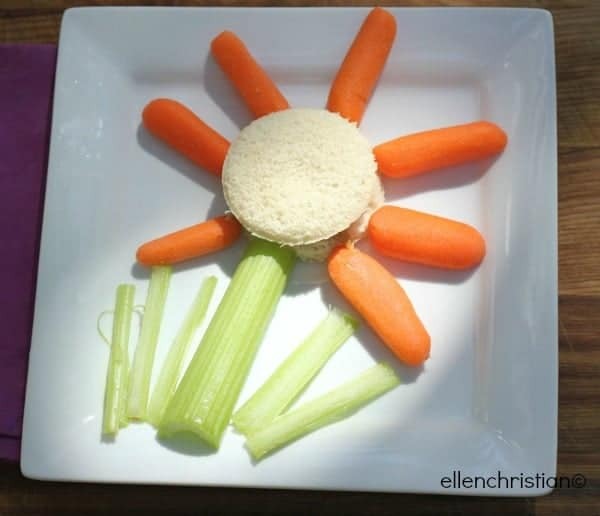 Arrange the baby carrots around the outside of the sandwich circle in a pattern to look like petals of the flower. Place the celery stick at the bottom of the flower so that it looks like the stem of the flower and the smaller pieces look like the leaves or grass. 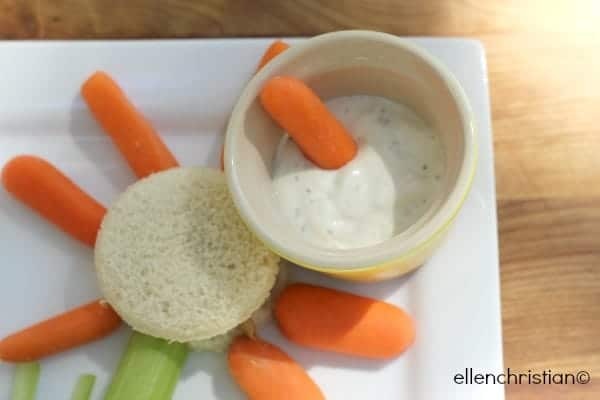 You can offer a little container of dip for your child to dip their carrot and celery sticks into if they prefer it that way. My son loves to have ranch dressing for his vegetables. Looking for more great lunch recipes for kids? Check out how to make fun-shaped sandwiches! This is adorable. Thanks for sharing this fun idea at the Home Matters Party! I just love this idea! I want my lunch to look like this! That is adorable – fabulous, fun idea and a great way to make veggies more attractive to the kids! Great idea. Nice to make it fun for the kids. this is such a great idea, I love how cute it is! What a creative idea! I know that my kids would love this! That’s so fun! My son’s pretty good about eating his vegetables but it’s still fun to be creative. So cute, kids love the shapes and designs but a lot of extra work and time! So simple and so cute. Even just as a little snack to share. That is such a cute way to make lunches fun! Those are very cute and something nice to do on a weekend to bring a smile to the kids. Great idea! It’s fun to make meals and snacks interesting and fun! I so love the flower! My kids would love it!!! My girls would love this for lunch! That is really cute but my kids won’t fall for it. I have to hide their vegetables in a sauce or soup. Great idea. Cute and easy! If it helps to get little ones to eat veggies I think its great! Cute way to make it more interesting for the kids. I know mine use to like to play with there food. Cute idea. I love sandwiches without crusts! Dip makes a big difference for kids. Our son loves hummus and dipping cucumbers in it! how cute! That’ll make them eat it! that is cute, my daughter would love that! So cute! Not sure my daughter would eat the carrots, but she’d love it! This is so cute. I think kids are more likely to eat their food if it is served in a fun manner.